When a Swedish woman heard something scurrying around in her kitchen, she expected to find a small mouse lurking in the dark. Instead, an enormous rodent dubbed “Ratzilla” by local media emerged from under the sink and terrorized her family for days. The epic “Viking rat” measured an incredible 40 cm long — plus tail. “I couldn’t help but do the old classic and jump on the kitchen table and scream,” Signe Bengtsson told the English-language newspaper, The Local. The family first realized something was wrong when their cat refused to go near the kitchen in their home in Solna, north of Stockholm. A few days later, Bengtsson went to take the garbage out, and found the giant rat devouring a “Swedish smorgasbord” of leftovers and scraps. 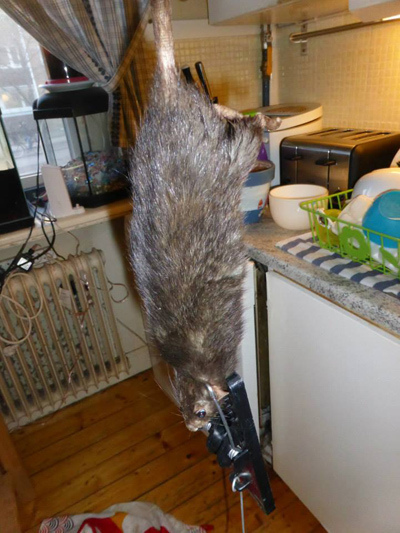 Justus Bengtsson-Korsas / FacebookThe Bengtsson-Korsas family found a 40-cm-long rat in their apartment near Stockholm. “It was right there in our rubbish bin, a mighty monster. I was petrified. I couldn’t believe such a big rat could exist,” she said. The rodent had gnawed through cement and wood to break into the the Solna apartment, pest controllers said. And once it was in, it flooded the kitchen by chewing through the water pipes connected to the dishwasher. It eventually became “so domesticated” that it “just sat under the table,” Bengtsson’s husband, Erik Korsas, said. A few days after the first sighting, the family put their kitchen on “lockdown” and called an exterminator, The Local reported, and pest controllers brought in three giant traps. But even after the huge rat was caught by the neck, the resilient rodent continued to run around, and dashed behind the dishwasher. 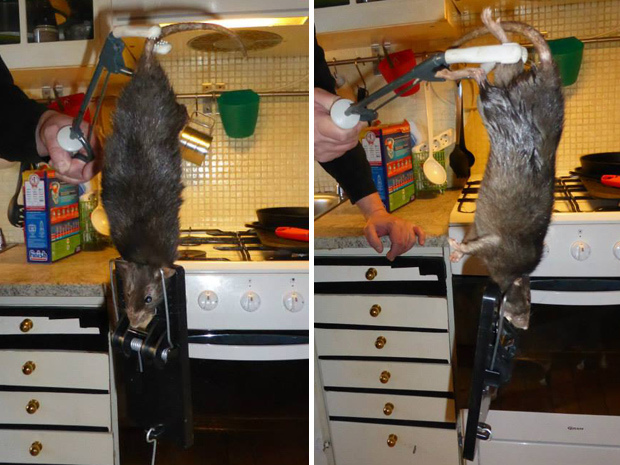 After it finally died, Korsas’ children were terrified that the “zombie rat” would “come back to life,” he said.